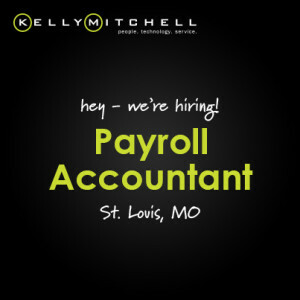 We’re looking for a n experienced Payroll Accountant (5-7 years) to take on the responsibility of managing all aspects of centralized payroll for over 800 KellyMitchell employees in 48 states including Puerto Rico. The Payroll Accountant also handles tax filings, W-2’s, cafeteria, and other deductions. As the Payroll Accountant, you’ll manage the centralized database and set up new company codes. We’re looking for a Payroll Accountant with great attitude, positive energy, and passion and desire to succeed. We value individuals who have excellent interpersonal and communication skills, and have an unwavering attention to detail.